Big Data & Society (BD&S) is a SAGE open access peer-reviewed scholarly journal that publishes interdisciplinary work principally in the social sciences, humanities and computing and their intersections with the arts and natural sciences about the implications of Big Data for societies. The Journal's key purpose is to provide a space for connecting debates about the emerging field of Big Data practices and how they are reconfiguring academic, social, industry, business and government relations, expertise, methods, concepts and knowledge. BD&S moves beyond usual notions of Big Data and treats it as an emerging field of practices that is not defined by but generative of (sometimes) novel data qualities such as high volume and granularity and complex analytics such as data linking and mining. It thus attends to digital content generated through online and offline practices in social, commercial, scientific, and government domains. This includes, for instance, content generated on the Internet through social media and search engines but also that which is generated in closed networks (commercial or government transactions) and open networks such as digital archives, open government and crowdsourced data. Critically, rather than settling on a definition the Journal makes this an object of interdisciplinary inquiries and debates explored through studies of a variety of topics and themes. BD&S seeks contributions that analyse Big Data practices and/or involve empirical engagements and experiments with innovative methods while also reflecting on the consequences for how societies are represented (epistemologies), realised (ontologies) and governed (politics). BD&S is a digital-only journal and its platform accommodates a variety of multimedia to present complex images and dynamic visualisations and video and audio content. Contents include peer reviewed research articles and colloquia as well as commentaries and annual multi-media 'demos' of key issues related to Big Data. The Journal is open access thus making its content widely accessible to readers. For its first three years, it was published without article processing charges (APCs) for authors. As of 1st July 2017 Original Research Articles which are submitted and subsequently accepted after peer review will be subject to an APC of $800. Authors who do not have funding for open access publishing should request a waiver from the publisher, SAGE, once their Original Research Article is accepted after peer review. For all other content (Commentaries, Editorials, Demos) and Original Research Articles commissioned by the Editor the APC will be waived. Big Data & Society is a born-digital publication and its content is more than simply the mere transposition of a paper version. It will be published on a platform that attends to the presentational issues that Big Data analyses demand (e.g., visualisation, multimedia, interactivity, code) and the challenges that digitisation presents for the future of scientific publishing (e.g., scholarly standards, protocols and scrutiny). One of the Journal’s goals is to allow for various digital media in the presentation of research. Some content can be best conveyed using multiple illustrations or video accompaniment. While still adhering to limits in article length, we encourage authors to use rich media and multiple visualisations and, when possible, to include links to data sources in the body of the article. We avoid the use of supplementary files and instead embed all components (figures, tables, video, and any additional data files) in the article. We will also use the power of open access to make our content as widely available as possible. We have designed a platform that allows for simple and clean presentation of a variety of content. But the initial platform is only the beginning. BD&S will solicit on-going feedback from readers and authors to make the design and presentation of content as accessible and usable as possible. Peer reviewed original research articles. The core content of the Journal is double blind, triple peer reviewed original research articles of up to 8,000 words with references. Commentaries. Short submissions (up to 3000 words with references) on issues, controversies, and questions that are timely and novel such as emerging theories, topics, and methods. Contributions from researchers at all career stages are encouraged and submissions are reviewed by the Editorial Team to facilitate quick turn around. Special Themes. Collections of articles and commentaries on a focused discussion of a specific topic related to Big Data. An annual call for proposals is made every June and submissions are co-edited by the Journal Editors and Guest Editors. Editorials. Written by Guest Editors of the annual special theme to provide an overview of the contributions. Demos. Annual multi-media demonstrations curated by the Journal Editorial Team of new methods, visualizations, experiments and approaches to the analysis of Big Data. The Journal invites contributions to its blog site at http://bigdatasociety.net. Essays and Provocations. Dedicated to short essays and provocations on topics relevant to the study of Big Data practices. Blogs and Video Abstracts. Authors of articles and commentaries are invited to write short blogs and produce 3-5 minute videos about their contributions. 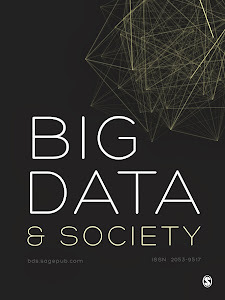 Big Data & Society (BD&S) is an open access peer-reviewed scholarly journal that publishes interdisciplinary work principally in the social sciences, humanities and computing and their intersections with the arts and natural sciences about the implications of Big Data for societies. Call for Proposals: Special Theme on “Critical Data Studies"